Average Height	: 27" - 29"
The Anatolian Shepherd is native to Asia Minor. It protects flocks and serves as a shepherd's companion. On the high Anatolian Plateau, summers are hot and very dry and winters are cold. The Anatolian Shepherd Dog is able to live outside all year round. For centuries the ancestors of the Anatolian Shepherd were used as combat dogs in war and for hunting. It was particularly valued for the victorious battles it could fight with wolves. The Turkish people would put a spiked color on them to protect their necks from getting bit by predators who attacked their charges. As a sheepdog, it was bothered by neither fatigue nor bad weather. Today it is still used as a sheep dog as well as a guard dog. The Anatolian Shepherd is very closely related to the Kangal Dog and some people even declare all Turkish shepherds i.e. the Kangal Dog, to be one breed, the Anatolian Shepherd, however the true Turkish Kangal Dogs are said to be a separate breed from the generic Turkish shepherd's dog. The isolated historical conditions of the Sivas-Kangal region have resulted in the development of the Kangal Dog as a distinct breed which has been declared the National Dog of Turkey and a national treasure. 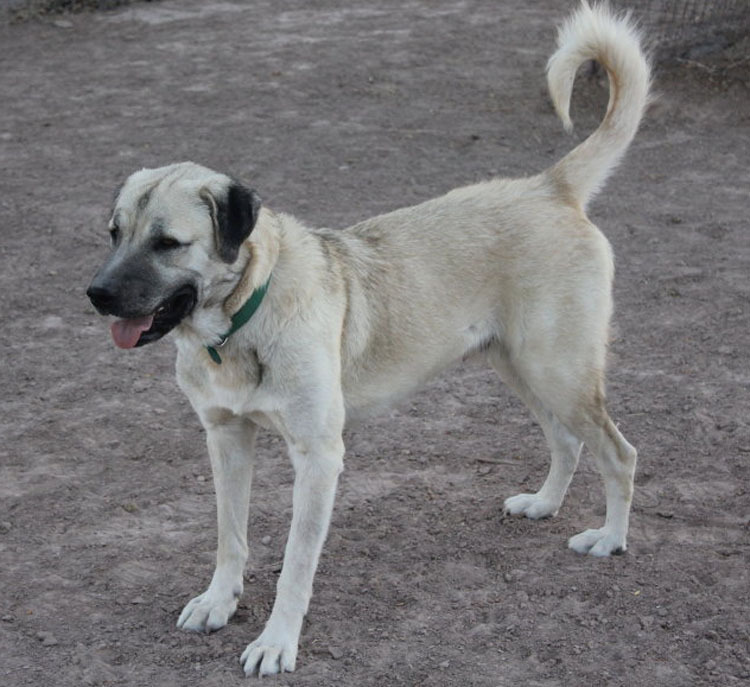 The true Turkish Kangal Dogs are first and foremost still primarily working shepherds. The export of pure Kangal Dogs from Turkey has been controlled and now is virtually forbidden. The Kangal Dog Club of America continues to work to ease import restrictions. Imported dogs are considered to be extremely valuable for their potential contribution to the genetic pool in the United States. The Anatolian Shepherd is large and powerful and is commonly used as a guardian dog. It has very similar traits as the Kuvasz and Great Pyrenees, but is more agile and tends to have a slender body type. Historically, these dogs have lived outdoors their entire lives. The dog may be suited to stay outside for the majority of the time, but can also be bought indoors in open spaces. It is a good idea to keep valuables and fragile items out of the way when these dogs are in the area since the dogs are fairly large. Since the Anatolian Shepherd is naturally guarded, they can also become very possessive. In a home or porperty setting, this allows them to keep careful watch on the grounds and will ensure that the family or property owner knows when a stranger is in the area. The dogs are fairly friendly with people in general, unless they have suspicion to be otherwise. The dog is demanding of itself, and can sometimes be dominant or stubborn. When training, it is important to begin as early as possible and use motivational training methods on a consistent basis. A loving approach fares well with these dogs and they are more likely to correct their behaviors in a safe, secure, and loving environment. A fully grown dog can become too strong to be corrected and may not listen to the owner's requests. These dogs are very sensitive to reprimands but they are always eager to receive affection. They are patient and protective of their owners, children, and loyal to their families. They are natural protectors and do not require extra protection training. They can get along with many types of animals but tend to take a dominant role with other dogs. The Anatolian Shepherd dog usually has Low immunity, and this can take longer to develop than other dogs. The Anatolian Shepherd requires very little grooming and the coat simply needs to be brushed out during shedding seasons. These dogs shed heavily, but the shedding period is relatively short and once the hair has been removed, they will not need extensive grooming rituals on a regular basis..
Anatolian Shepherds need a lot of exercise and they will perform at their best when they can run free in the yard. This is why a fenced-in yard is so important, and it can be very beneficial for owners to create a wide area and space for their dog. These dogs have boundless energy both indoors and out. If they are not outside enough, they can become restless and destructive. Taking them for walks in the park or outdoors to play will help them get the exercise they need on a regular basis. The Anatolian Shepherd can be very playful and full of energy during bonding time with the owners. They tend to enjoy running alongside with you in parks and beaches, or playing with a Frisbee. They are excellent with 'fetch' games and can become very efficient. Regular walks are mandatory with the Anatolian Shepherd, and even when they are getting plenty of natural exercise from being outdoors, a formal walk can help them bond better with their owners and help them explore new parks or territory. Ideally, two walks per day are sufficient for them to meet their daily exercise needs. Keep in mind that these dogs have enormous amounts of energy and may even distribute their energy in short spurts. They do not fatigue easily, and will stay up late if needed just to run around and get the high levels of activity they need. Anatolian Shepherd dogs have natural instincts to learn how to guard and protect their territory, and rarely need formal obedience training to learn these skills. These dogs are adaptive and learn very quickly, and they will take direction from you with minimal reprimanding. They need to have plenty of space to move around, and giving them access to a kennel will help them to distinguish their boundaries. Puppies can follow you around as you do chores and take part in activities as they can bond well during this time. The dog will need to be reprimanded on occasion but will quickly learn from its mistakes. Frustrations may arise due to this dog's natural independence and ability to move quickly. The dogs are observant, intelligent, but can also become manipulative if they are distrustful of their owners. Since they are large in stature, it can become difficult to chase them down. However, once they learn their boundaries and rules, they become very strong and protective owners.